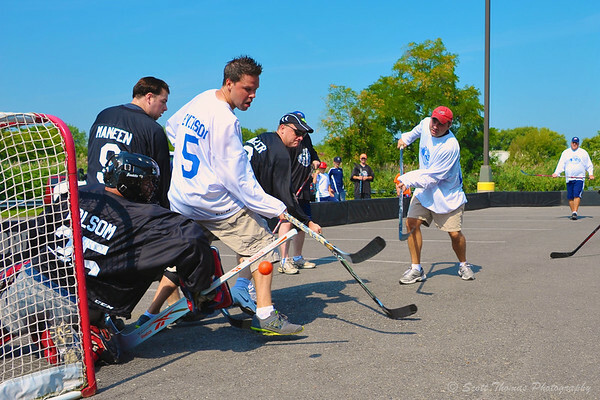 Brent Axe takes a shot on net through a screen by John Evenson (5) during the 2012 Media Street Crunch game held Saturday, August 25 at Alliance Bank Stadium in Syracuse, New York. Nikon D700/28-300VR, 1/500s, f/8, ISO 200, EV +0.3, 28mm focal length. Each summer, the Syracuse Crunch AHL Hockey Club sponsors a series called the Crunch Bunch Kid’s Club Street Hockey games. The Crunch set up street hockey rinks, nets, sticks and supply referees for the games. On the last day of the series, the Media game is played between members of the Syracuse Crunch front office personnel and The Score 1260 radio station who carry the Crunch’s season games. This is a friendly game between teams GM’d by Crunch owner Howard Dolgon and Score 1260’s afternoon personality Brent Axe. It was a fun game to watch and you could tell each team was playing for bragging rights. This year, Team Dolgon came out on top by the score of 8 to 6. I will be sure to tune in later today to hear what Brent Axe has to say about it. With the NHL headed for another labor dispute, I am looking forward to watching the Crunch this season with their new affiliation with the Tampa Bay Lightning. This entry was posted in Weekly View and tagged 28-300mm, alliance bank stadium, brent axe, crunch, game, media, new york, nikon D700, on the block, radio, score 1260, station, street hockey, syracuse, vr. Bookmark the permalink.